Weft extensions are the most versatile option on the market. The word 'weft' actually refers to the hair extension itself, a hair weft is almost like a curtain of hair extensions. The word 'weave' usually refers to the application of the weft extensions into the hair. There are a number of different application methods available. After your free consultation and hair assessment we can offer you the best weft application method for your hair type and lifestyle. Weft extensions are great for adding both additional length and volume and they are suitable for nearly all types of hair that are around shoulder length and longer. Another great thing about using wefts is that they are very quick to install and remove, a full head of hair extensions can take around an hour. Adding hair extensions in this way creates the look of very full hair which lies smooth and blends seamlessly with your own hair without the need for lots of attachments. Many clients find these methods much more comfortable to wear and easier to maintain than other extension methods which makes them so popular. The amount of extensions you will need depend from person to person. On average, people can have 2 - 4 rows of weft extensions. Small sections of your natural hair and micro beads are linked create a flat 'track' or 'row' in your natural hair which sits very flush against your scalp. The hair extension weft will be sewn directly onto the track and fit in seamlessly in with your own hair. The silicone lining of the micro beads cushions and protects your natural hair from damage and prevents slippage of the extensions. A braided weave is where your natural hair will be tightly braided on horizontal lines to create the tracks in your natural hair. The hair extension weft will be sewn directly onto the track to fit in seamlessly in with your own hair. It is best suited to those with thicker hair which will be strong enough to support the hair extensions. If is not advisable for those with very fine hair, due to the risk of damage to your natural hair. This is a great option for those with allergies to metals or silicones as there is no need to micro beads fit your hair extensions. Using weft hair extensions with the methods above hair extensions can be reused at maintenance appointments. When your hair extensions require maintenance, the old attachments are removed. The hair extension and the natural hair are checked for health and condition. The extension then reapplied with fresh attachments, to a new strand of hair to allow the previous section to rest. 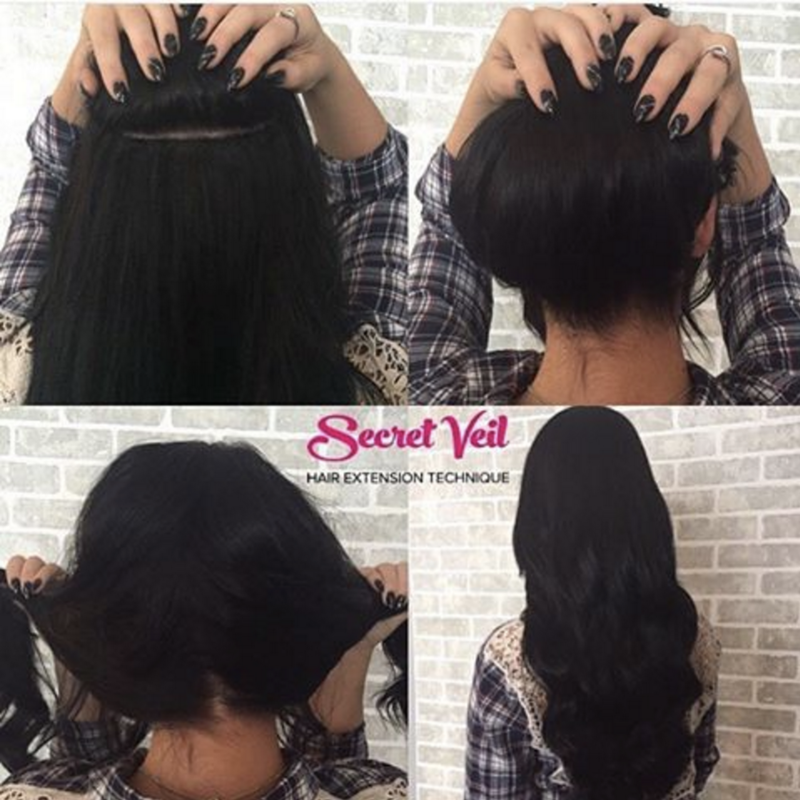 After launching the Secret Veil, it has quickly become the #1 hair extension method used by stylists due to it’s invisible attachments, non-damaging properties, ultra-secure installation and quick maintenance appointments. You can now find the Secret Veil in salons and extension studios in over 150 salons & in 5 countries world-wide. We are Dolls is the the first salon in Melbourne to be offering the exciting new method. Whether your hair is pulled up or left down, rest assured you won't be able to see any hair extension attachments whatsoever. Your hair is as important to us as it is to you! We conduct thorough consultations to ensure our hair extensions are the right fit for your hair.
" The most discreet hair extension method in the world. " Sections of your natural hair are sandwiched between two strips of hair extension using strong adhesive tape. The result lies flat in your natural hairstyle allowing your extensions to blend seamlessly. Tape weft extensions are great for those who want to achieve additional length and some volume, especially for those with fine or short hair and very layered styles. Tape extensions are very kind to your natural hair and are quick to apply and remove. It is great technique to if you want to update your style with flashes colour, even if you don’t want to add any additional length. Adding colours using tape hair extensions is a non-commitment, non-damaging way to freshen your look. Using the tape weft application method your hair extensions can be reused at maintenance appointments. When your hair extensions require maintenance, the extensions are removed. The hair extension and the natural hair are checked for health and condition. The extension then reapplied with a fresh tape, to a new strand of hair to allow the previous section to rest. Clip-in extensions are so versatile and perfect for those of you who don’t want to commit to semi-permanent extensions. With clip-in hair extensions, you can have length and volume in minutes. And when you’re done, simply unclip and remove. You can install them yourself, or with the help of a stylist. Because they are so easy to put in and out, your look can change in an instant making them perfect for special occasions for just for a night out. Our clip-ins extensions are made with the same quality 100% European Remy human hair as our other extensions, so they can be styled just like your natural hair. Clip in human hair extensions can last well over 12 months if they are well cared for. The method we favour uses individual silicone lined beads to gently secure strands of human hair extensions to small sections of your natural hair. The silicone lining cushions and protects your natural hair from damage and prevents slippage of the extension. Micro bead hair extensions are great for adding both additional length and volume. They are best suited to fine-medium and thicker hair types that are shoulder length and longer. It is great technique to if you want to update your style with highlights or lowlights, even if you don’t want to add any additional length. Adding colours using micro bead human hair extensions is a non-commitment, non-damaging way to freshen your look. Using the micro bead application method your hair extensions can be reused at maintenance appointments. When your hair extensions require maintenance, the old micro rings are removed. The hair extension and the natural hair are checked for health and condition. The extension then reapplied with a fresh micro bead, to a new strand of hair to allow the previous section to rest. Micro bead hair extensions can last up to and over 12 months if they are well cared for. What are hair feather extensions? Hair feather extensions are the latest trend in hair and fashion. They are extremely popular in the US and are growing in popularity here in Australia. Because of the variety of colours and styles, feather hair extensions look great on people of all ages. The best part of feather extensions is that they don't require any special care. They can be brushed, washed, blow-dried and styled with a curling iron or flat iron. Hair feathers are a natural product and are in limited supply due to the unprecedented demand by salons and consumers in the United States. We only sell thin, premium quality, genuine rooster feathers that are the optimal length and width for feather extensions. Beware of low priced fakes.